You will receive the Kutrick Neo Metal Core Pro Scooter KIT that includes: - Kutrick Long-term durable Metal Core 110mm Pro Scooter Wheels (sold as set of 2pc wheels) - Includes set of Abec-11 Bearings pre-installed - Kutrick durable Pro Scooter Pegs (sold as set of 2pc pegs) - Scooter Peg Axle Bolts (3pcs) - Kutrick Products are Strong, Light and Durable Alloy Construction that works with almost all Pro Scooters Brands. 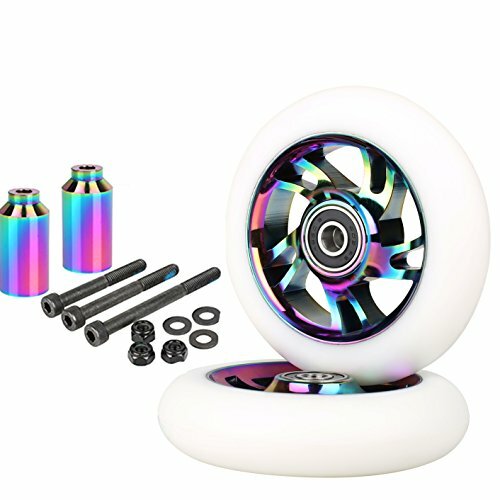 The Wheels for Envy S3 S2,Fuzion X-5, Z250/Z300/Z350/Z375,Vk-LMT and all scooters with 110mm wheels. The 110mm wheel with abec-11 bearing come with 2pcs(1 pair),also the pegs come with 2pcs(pair). The Scooter Pegs Made of high grade 6061 Aluminium and strong/lightweight ideal for street riding/Grinding. Normally 2.5" Axle with One Peg in Front and 3.0"/3.5" Axle in Rear,install 2pegs Axle should be longer. If you have any questions about this product by Kutrick, contact us by completing and submitting the form below. If you are looking for a specif part number, please include it with your message.